What would you do for an opportunity to work with sea turtles every day? Working with sea turtles is part of what Carol, a member of the NC Aquarium at Fort Fisher’s husbandry staff, does for a living. 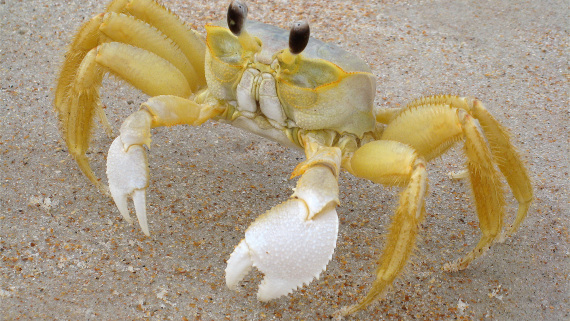 Carol cares for sea turtles, alligators, amphibians and even stingrays each day. Carol holding a loggerhead turtle. 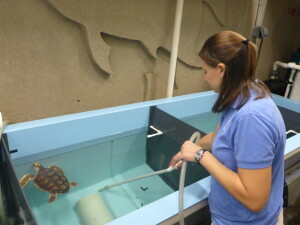 Carol begins every morning by feeding the loggerhead sea turtles. She ends her day the same way. In between she spends time cleaning their exhibit, cleaning their shells and preparing their food. 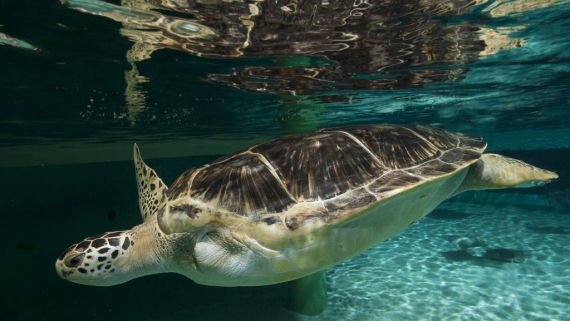 You can see what it takes to care for the sea turtles in this video. 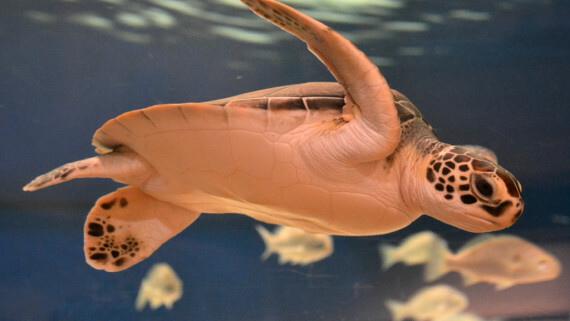 The turtles Carol cares for spend much of their time on exhibit teaching the Aquarium’s visitors about issues facing sea turtles. “I enjoy raising them from hatchlings so that the visitors can make the connection with the animal and feel a sense of responsibility towards the population’s success,” said Carol. 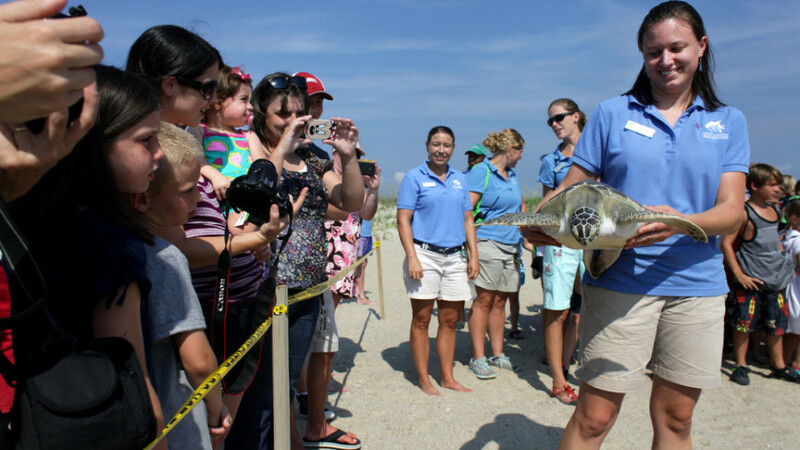 As a former educator, Carol is dedicated to teaching visitors about the sea turtles. She is also fortunate to be a part of sea turtle releases when turtles have been successfully rehabilitated at the Aquarium. 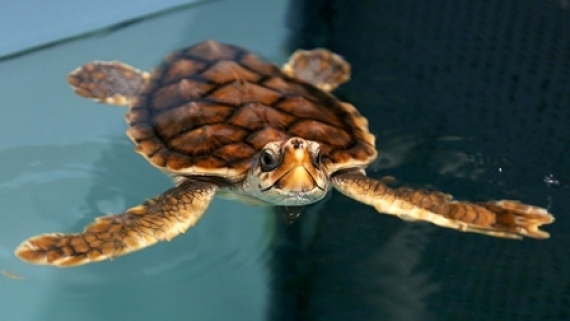 The Aquarium rescued a turtle from the Fort Fisher State Park in 2013. 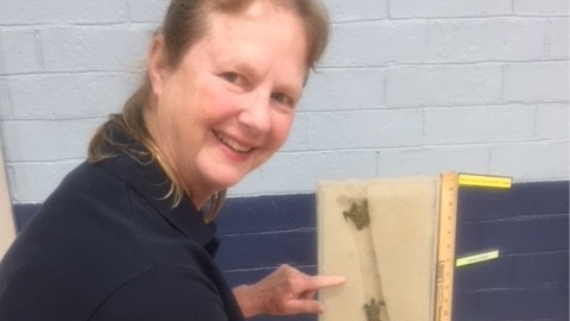 Carol helped care for the turtle named Womble and after he recovered she was the one lucky enough to return him to the ocean. You can watch Carol releasing Womble. Then click to learn more about Womble’s Tale. Big releases can’t happen every day but caring for sea turtles does. Carol does a wonderful job with our sea turtles and soon will have a new group of hatchlings to raise. 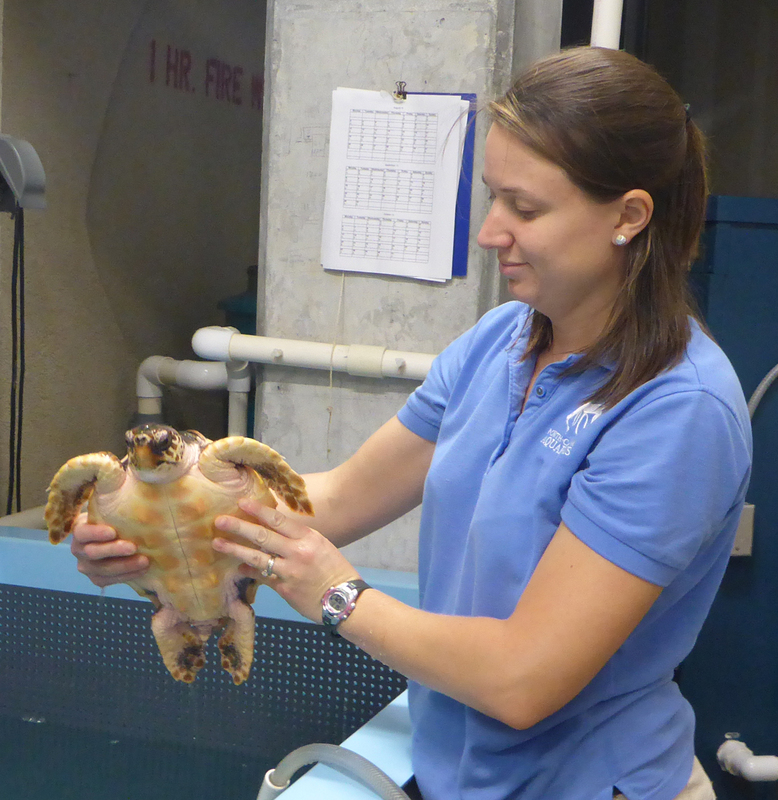 Join us next week as we meet Julie, the other aquarist in charge of the sea turtles at the Aquarium. 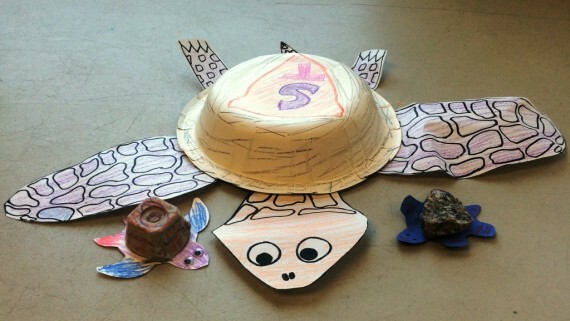 What do you think would be the best part of working with sea turtles? Tell us in the comments below. 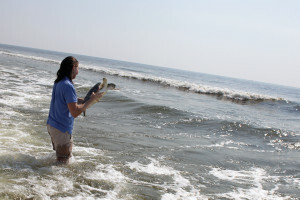 Carol releasing Womble into the ocean.